For anyone who has ever wondered how cameras work, this book is a pleasant way to learn. It is generously endowed with enough fundamentals to satisfy the technical specialist, without intimidating the casual but curious amateur photographer. The author has repaired, modified, and designed and analyzed cameras for the past forty five years. With this background, he goes beyond describing camera functions based on advertised data, instead the book explains how various cameras really work. 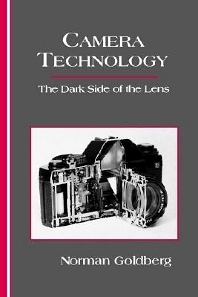 The book peels off the cover panels and lets you look into the dark side of the lens. The dozen or so formulas use simple math and the drawings alone are worth the price of admission. Focusing. Exposure. Time Lag. Viewfinders. Film Support. Hardware. Testing. Appendices. Basic Optical Formulas. Focusing Error Formula. Cardinal Points for 35 mm SLR Lens. Bibliography. Glossary. Index.